Need to change the tires on your car, STAT? Then you need an air impact wrench. The best air impact wrench delivers a considerable amount of power without rattling your eardrums. Check out our roundup of the best air impact wrenches for this year! What to look for when choosing the best air impact wrench? We looked at torque, speed and the strength of the twin hammer if the wrench had one. All of the air impact wrenches we looked at had 1/2-inch sockets. Only one had a pretty impressive torque — the AIRCAT 1150 “Killer Torque” wrench delivers a max torque of 900 ft-lb. The rest were in the 500 to 600 ft-lb range. The AIRCAT also took the prize when it came to strength. Its twin hammer has 1,400 blows per minute, making it one of the most robust air impact wrenches out there. The AIRCAT 1150 Killer Torque impact wrench lives up to its name — it has a loosening torque of 1295 ft-lb, more than twice the amount of torque of other models in our roundup. The max torque is 900 ft-lb. The impact wrench also has a speed of 9,000 RPM and delivers 1,400 blows per minute. The manufacturer claims that it’s the strongest 1/2-inch impact wrench available. Despite its high power, the air impact wrench is pretty quiet. It produces a volume of 86 decibels when in use. People who’ve used the AIRCAT impact wrench have praised the power of it as well as its quietness. A few have noted that you need to choose the length of hose you use with the impact wrench carefully. Generally speaking, the shorter the hose, the better. You’ll lose power if you use a hose that’s longer than 25 feet. To compensate for that loss of power, you might have to bump up the pressure from the air compressor to around 120 psi. Another complaint people had about the air impact wrench as that it vibrated pretty fiercely when they used it. A few were concerned about the vibrations causing the nuts to drop off, scratching wheels. You need to use a short hose, which can limit your movement and the wrench’s portability. The Ingersoll Rand Air Impact Wrench is one of the pricier options on the market. Does it live up to its higher-than-average price tag? Well, for one thing, the air impact wrench has a maximum torque of 600 ft-lb, which is slightly less than the AIRCAT. It has a power regulator so that you can adjust the amount of torque provided based on your needs. It also comes already lubricated, so all you need to do the first time you use is it is connect it to an air compressor and hose (sold separately). The air impact wrench has an RPM of 8,000. The handle is designed to be comfortable and ergonomic. People who’ve given the Ingersoll Rand Air Impact Wrench a try have been pretty satisfied with it. One person called it “the bomb” while others were impressed with how quickly the wrench was able to remove nuts and bolts. A few have noted that although the impact wrench comes pre-lubricated, it’s important to maintain it and oil it after prolonged use. The air impact wrench from Campbell Hausfeld can have up to 550 ft-lbs of what the manufacturer calls “nut-busting” torque. It’s designed for changing car tires, fixing brakes or replacing the blades on a lawnmower. The air impact wrench features three speeds and an easy to use speed regulator. It can spin up to 8,000 RPM. The twin hammer action delivers 1,200 blows per minute, not as many as the AIRCAT but not too shabby, either. The twin hammer’s impact mechanism is also designed to minimize the wrench’s vibration, a feature that will make people who don’t like a shaky wrench happy. Speaking of users of the wrench, they’ve been pretty happy for the most part. One person was thrilled with the wrench’s performance, noting that it was just what they were looking for. People who weren’t super thrilled with their impact wrenches complained about the lower power provided by the wrench. One noted that it struggled to remove the tires from SUVs and trucks but handled car tires without issue. Another person noted that the size of the air compressor matters with this wrench. You’ll want to buy a tank that can hold at least eight gallons of air. Otherwise, you won’t get the performance you were expecting from the impact wrench. The PowRyte air impact wrench is another air impact wrench that promises a max 600 ft-lb of torque. It also has a twin hammer but doesn’t claim as to how many blows per minute it provides. We think of the PowRyte as a good starter air impact hammer. Although some people claim that it’s as good as their Ingersoll Rand models, others are quick to point out that the PowRyte model doesn’t deliver when it comes to power. One person questioned the max torque rating on the impact wrench, and a few have claimed that they’ve been unable to use the wrench to remove lug nuts on tires or bolts on their engine mounts. The critical comments on the PowRyte air impact wrench are largely drowned out by the positive ones, though. A few people have praised the amount of power they got from the wrench, particularly for the price they paid. 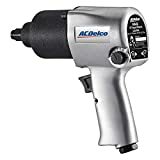 The ACDelco air impact wrench might be another “starter” impact wrench. It has 500 ft-lbs of maximum torque and a 3-speed regulator (max speed of 7,000 RPM). The ACDelco makes some claims of being rugged. It’s made from aluminum and also has a comfort grip handle to improve its ergonomics. Unfortunately, the claim of ruggedness didn’t match reality for some users of the ACDelco air impact wrench. A few noted that it didn’t last very long for them, with some claiming that theirs broke after just a few months. Others who’ve used the wrench have had a more enjoyable experience, with quite a few saying that the power of the wrench was sufficient for their needs. Several also noted that it’s best suited for smaller jobs or the DIYer, rather than a professional mechanic. The shape of the impact wrench makes it easy to use in tight spots. It might surprise you to learn that not all impact wrenches are created equally. In fact, you can divide impact wrenches into three categories. Right now, we’re looking at the best air impact wrenches. But you can also choose impact wrenches that are cordless (battery-powered) or powered by electricity. What’s the difference? Let’s review. Air impact wrenches. The OG impact wrench. An air impact wrench is powered by compressed air. You can find air impact wrenches in a range of drive sizes — from 0.25 up to 1 inch. The larger the drive, the more torque the wrench has. Electric impact wrenches. A rarity these days, electric impact wrenches feature a cord and need to be plugged into an outlet. They have a limited range of drive sizes, usually just 0.5 and 0.75 inches. Cordless impact wrenches. Cordless impact wrenches have pretty much replaced their corded brothers. They’re battery-powered and super convenient for use in tight spaces or areas without electricity. The big disadvantage of cordless impact wrenches is that they are less powerful than air impact wrenches. Also, you need to charge up the batteries. 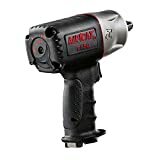 The biggest benefit of working with an air impact wrench is that air-powered (also called pneumatic) wrenches are much more powerful than electric or cordless models. You’re going to get more torque when you use the best air impact wrench (keep calm, we’ll explain torque in a bit). More powerful from the wrench means that less power is needed from you. An air impact wrench can make it super easy to remove bolts, which also usually means you’re able to work faster. Air impact wrenches tend to take up less space and are easier to handle compared to electric impact wrenches, which have a bulky motor built into the wrench itself. 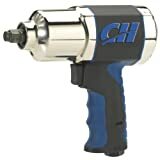 Finally, an air impact wrench is super convenient, provided that you have a canister of compressed air. You don’t need an electric power source or need to wait for the batteries to charge up. Those of you who didn’t enjoy high school physics (or who maybe never took it) might be scratching your heads right now, wondering what the heck “torque” is. Torque is the measurement of the force required to make an object rotate. 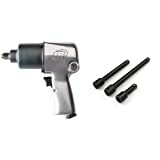 When you use an air impact wrench, you’re usually using it to attach or remove bolts. The higher the torque, the faster those bolts will spin and the quicker they’ll either be firmly attached or loosened. If you’re going to use an air impact wrench, you’re also going to need a hose, air compressor, and air tool oil. First, connect the hose to the air compressor, then connect the other end of the hose to the wrench. Make sure the hose is smooth and doesn’t have any twists or kinks — otherwise, air won’t flow through easily. Set the pressure on the air compressor to somewhere between 90 and 100 pounds per square inch (PSI). Oil the turbines of the impact wrench to lubricate them and to help the wrench work smoothly. Test out the wrench to see which direction it’s set in. If you need to change direction, there should be a switch on the wrench that lets you do so. Remember, lefty loosey, righty tighty, if you’re not sure which direction you need. To use the wrench, slip the socket part of it over the top of a lug nut (such as the bolt that attaches a wheel to a car). Pull the trigger on the wrench and watch as the socket spins and quickly removes the nut. We’re going to recommend the AIRCAT 1150 Killer Torque 1/2-Inch Impact Wrench over the rest. It’s got the most strength and power but still operates quietly. Of course, that power and strength do come at a cost. The AIRCAT might be the best of the bunch, but it’s also one of the most expensive of the bunch too. We hope this list of the best air impact wrench reviews was worth your while!